Tell us a little about yourself and what your primary focus at VSA is. Dr. Smith: I am a board certified vascular surgeon that just joined the practice in 2017. I trained in Ohio at the University of Cincinnati. I was previously an engineer in the Air Force. I also have a doctorate degree in biomedical engineering, primarily researching in the field of therapeutic ultrasound. I have lived across this great country, growing up in a military family, as a veteran myself, and then supporting my military husband. My primary focus at VSA is providing quality care and treatment to our patients. Dr. Smith: Our team-based approach in providing the best vascular care for our patients. Our group has been in Tallahassee since the 1970s; therefore, we have long established our ability to provide this care. Why did you decide to specialize in vascular surgery? 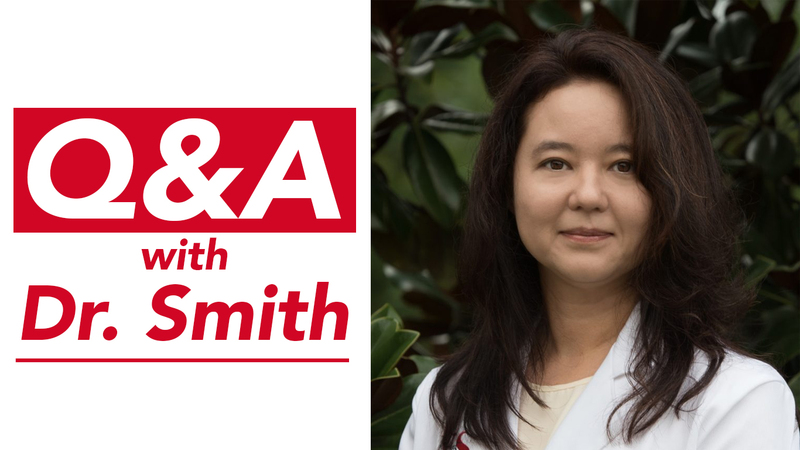 Dr. Smith: During my clinical year in medical school, the very first surgery I saw was an endograft repair of an abdominal aortic aneurysm by a vascular surgeon. He performed this via two small groin incisions. This patient went home the next day. Just two decades ago, repairing an abdominal aortic aneurysm was primarily performed through a large abdominal incision with long hospital stays. I also realized that vascular surgeons use ultrasound every day in their practice; it then became a clear decision to become a vascular surgeon. How has technology changed vascular surgery? Dr. Smith: Technology has completely changed vascular surgery. Most of vascular surgery is now performed in minimally invasive ways that do not require what’s referred to as an “open” incision, which has to be done in a hospital operating room. This approach improves patient outcomes overall and eliminates the need for a hospital stay. Since you’ve been in the field, what developments or breakthroughs have occurred? Dr. Smith: The use of percutaneous atherectomy and mechanical thrombectomy devices have revolutionized how we practice vascular surgery. The ability to remove atherosclerotic plaque or clot from a vessel via minimally invasive techniques without the need for open incisions is extraordinary. Why should the average person worry about their vascular health? Dr. Smith: Obesity or being overweight is an epidemic in the United States. We have the highest rates of obesity in the South with certain states having rates greater than 35% of the population. Obesity is an independent risk factor for cardiovascular disease. This can predispose you to heart attacks, high blood pressure, leg pain, and stroke. What simple ways can the average person improve their vascular health? Dr. Smith: Walk for twenty minutes at least three times a week. Make simple changes in your diet that decrease salt and fatty intake. Don’t smoke. Visit website http://tobaccofreeflorida.com or seek help from your physician. How important is exercise beyond weight loss? Dr. Smith: It improves overall cardiovascular health. How important is diet aside from maintaining a healthy weight? Dr. Smith: Reducing your salt and fatty intake has shown to decrease atherosclerotic plaque formation, cholesterol as well as blood pressure. Could you share a VSA Success Story with us? Dr. Smith: My first leg bypass surgery in Tallahassee was for a Korean war Army veteran. He had previous leg bypasses that failed and continued to have pain in his foot. He currently is recovering and no longer has pain. Taking care of our veterans is a privilege and an honor. His case will always be remembered.